Some SPA patients reported quicker recovery time, less pain, and less swelling. Single Portal Arthroscopy (SPA) requires only a single, minimally invasive incision to get you back on your feet, and back in the game. Arthroscopy is a surgical procedure that helps surgeons to diagnose and treat certain joint problems caused by injury or everyday wear and tear. Unlike early arthroscopies, which required up to three entry points for surgical instruments, today’s arthroscopic surgery uses minimally invasive endoscopic techniques to view, diagnose, and treat problems that affect the knee, shoulder, hip, or ankle. 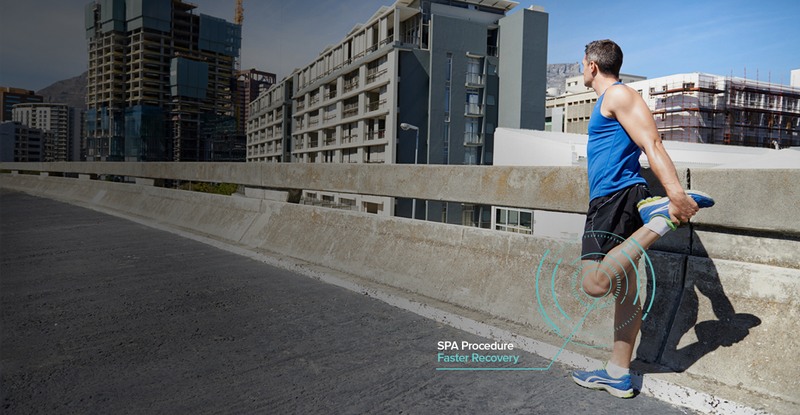 Single Portal Arthroscopy (SPA) is an innovative approach to standard arthroscopic surgery and was developed to create a less intrusive method for repairing joint injuries, particularly in the knee. In late 2009 the ParallelPortal System was designed. By December 2012 the first procedure utilizing the ParallelPortal was performed using one incision site to access, view, and treat certain pathologies. The information in this SPA site is provided for educational purposes only and is not meant as medical advice. Accordingly, Stryker assumes no liability related to your decision to pursue SPA based on any information provided in this SPA site. Speak to your doctor to decide if SPA is right for you and your specific condition. As with any surgery, SPA carries certain risks. Your doctor should explain the possible complications of surgery as well as any side affects you may experience. Your doctor should also let you know what to expect before, during, and after surgery which may be different from case to case. SPA patients, on average, reported less pain at day 2, day 4, day 7, day 30, and day 90 with statistically significant results at days 4 and 7; less scarring and tenderness at three months post-op; less interference with daily routine activities and playing sports at one month than 2 portal patients; 42% of patients required no pain pills after leaving the facility compared to 10% of 2 portal patients. : American Academy of Orthopaedic Surgeons. (2010). Knee Arthroscopy. In OrthoInfo. Retrieved March 9, 2014, from http://orthoinfo.aaos.org/topic.cfm?topic=a00299. : Osteoarthritis Education. (2014). Retrieved March 9, 2014, from http://www.djoglobal.com/education/patient-education/osteoarthritis-education. © 2014 Stryker Endoscopy. San Jose, CA 95138. ® and ™ Marks Owned by Stryker, Inc. All rights reserved. Any third-party trademarks used herein are the property of their respective owners. This site is intended for U.S. residents only.